U.S. Sen. Chuck Schumer said Thursday there's an urgent need for more federal railroad bridge inspectors due to the combination of old infrastructure and stepped-up oil shipments. Schumer said there are 3,000 rail bridges in New York, most of them privately owned, and only one federal inspector assigned to monitor the spans for safety purposes. The inspector is also responsible for overseeing rail bridges in 13 other states. "New York as you know has some of the oldest and most frequently used infrastructure in the nation hands down, and that is particularly true when it comes to rail," he told reporters in a conference call. "Part of the reason is we are an older state. Another reason is New York has always been a vital geographic link between the Midwest and the East Coast." Schumer said that adding $1 million to the Federal Railroad Administration budget would double the number of available inspectors. He said public roadway bridges in New York must be inspected every other year, and private rail bridges must be inspected by their owners annually, subject to federal oversight. "We should not be waiting for a derailment or a horrific collapse to do something to make sure our train bridges are safe, privately owned or otherwise," Schumer said. He said 2,158 of the 3,000 rail bridges are in upstate New York, including 281 in the Capital Region, 261 in Central New York and 307 in the Hudson Valley. Even in the sparsely populated northern region of the state, there are 144 privately owned rail bridges. He said increased shipments from the Bakken oil fields and the resulting wear and tear on New York rail infrastructure "should caution us to make rail infrastructure safety a priority. ... It's very likely many of the bridges are deteriorating and some of them may be deteriorating fast." 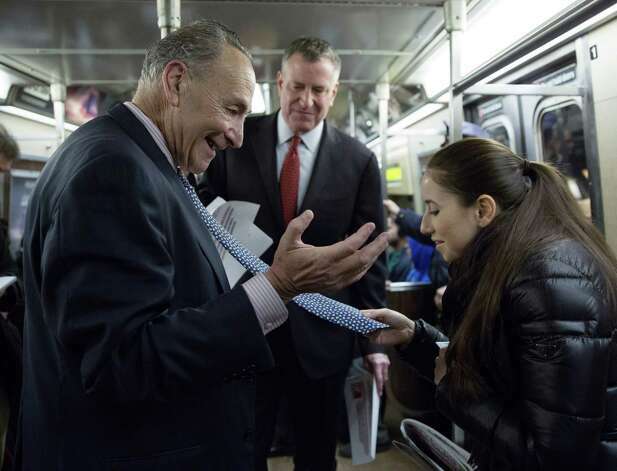 Schumer also released a letter Thursday to the FRA pledging support for increased funding for rail safety. The letter said there are an estimated 70,000 to 100,000 privately owned rail bridges in the U.S.
Ed Greenberg of the Association of American Railroads said the industry was doing its own rigorous inspections. "At any point during the day or night, the nation's rail network is being inspected, maintained or upgraded to handle today's rail traffic," Greenberg said in an email. "The freight industry shares the public's concern over recent high-profile incidents," he said, "and railroads recognize, as part of a shared responsibility with shippers and other stakeholders, more has to be done to further advance safety." If we were just talking regular freight, this is a fine recommendation but we’re talking Bomb Trains so increased rail inspectors doesn’t cut it. What Schumer should be talking about is a war effort to get off fossil fuels altogether and adopt the Jacobson plan of 100% renewables in NYS by 2030.